That’s right! 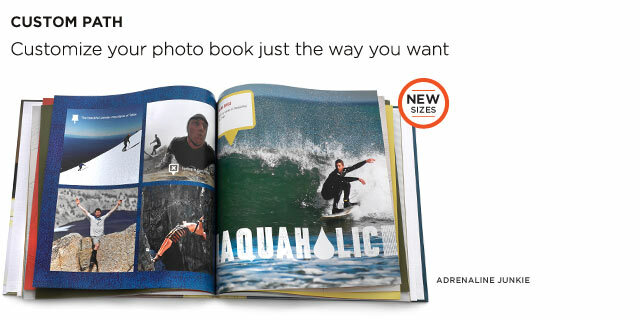 You can snag a FREE 8×8 Shutterfly Photo Book with this promo code, now through September 11, 2013 (11:59 P.M. PT). If you’ve never experienced one of these books – I strongly urge you to take the time to create one (you’ll want to make sure you leave enough time to create your book before the offer ends). I’ve made several in the past. For instance, one that I made was just of a trip to DC my daughter’s class trip went on. Another was one of when my son went to camp this past summer. You can share your books online via email or social media sites. And like I said earlier – be sure leave yourself enough time to create your book – there are a LOT of options to choose from, and you’ll want yours to be just so. Each time you make one – getting it right gets easier and easier. Offer cannot be redeemed more than once per account and/or billing address. Taxes, shipping, and handling will apply. You may add options to your book (extra pages, cover options, layflat pages, Storytelling styles, memorabilia pockets, etc.) at additional cost. Alternatively, you may apply the “Offer Value” of $23.99 — the current price of a 20-page 8×8 hard photo cover photo book — toward the purchase of any larger photo book. Not valid on 5×7, 7×9, 8×8 soft cover, or 8×11 soft cover photo books, prepaid plans, other products, or prior purchases. Hurry to Shutterfly and start creating your book – you don’t want to miss this freebie. these make great gifts! Thanks for sharing! Oh man I am going to have to make one of these! I love their photo books!!! I think photo bookstore the greatest things ever. I’ve made several and love to know about the free ones! This is a great deal on a photo book and I would love to get this for some of my new photos. I think this is a great deal.